Dungarees is a widely-trusted retailer for work clothing, including brands such as Wolverine Boots, Filson Luggage & Bags and one of the largest inventories of Carhartt apparel anywhere online. They operate two physical stores, as well as an e-commerce site at Dungarees.net. 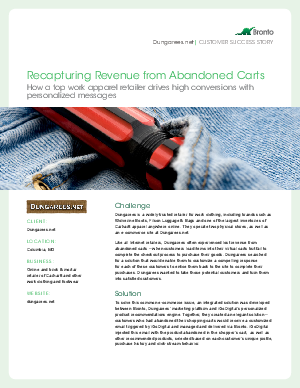 Like all Internet retailers, Dungarees often experienced lost revenue from abandoned carts, when customers load items into their virtual carts but fail to complete the checkout process to purchase their goods. Dungarees searched for a solution that would enable them to customize a compelling response for each of these customers to entice them back to the site to complete their purchases. Dungarees wanted to take those potential customers and turn them into satisfied customers.